In case you missed it, the Backstreet Boys dropped a new album, DNA, on Friday. 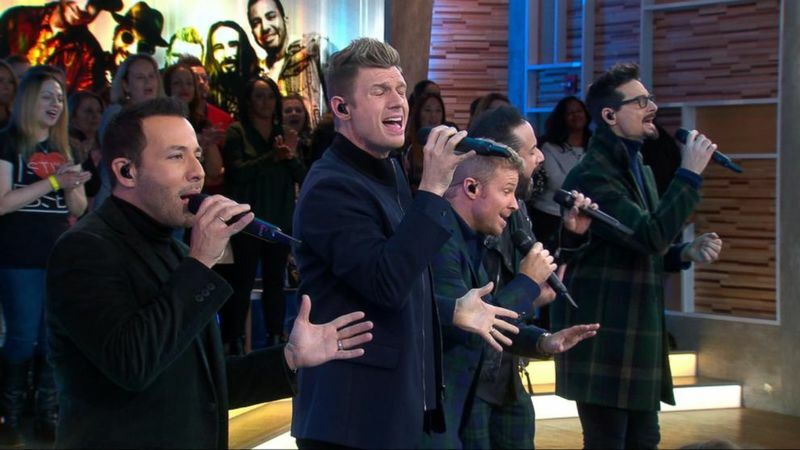 It’s an album drop that would have been hard to miss considering Kevin, Howie, AJ, Brian and Nick have been taking over the internet, television and more in the past week with what’s being called their biggest album drop in 20 years! In fact, Billboard is already predicting DNA to hit the #1 spot on Billboard Top 200 chart - a first for the Boys in this decade. With perhaps their biggest album since 1999’s Millennium came a New York City celebration that was reminiscent of the peak of BSB history. The five landed in the Big Apple after a week of DNA promo in Japan and jumped right event after event, with hundreds of fans braving freezing temperatures to catch a glimpse of, a selfie with, or an autograph from them. One thing everyone had in common worldwide though? The love for DNA is LOUD and clear. “It is an undeniable testament to the @backstreetboys chemistry, which has been forged over the years. And the vocals are heaven-sent. Seriously, chill-inducing. Unsurprisingly, the rest of the LP holds up with the excellent buzz tracks,” wrote Idolator. Favorable reviews also followed from Elle and Billboard as well as thousands of compliments from fans, celebrities and public figures online. If you haven’t taken a listen to or purchased the album yet, find all the ways you can do so here. From The Tonight Show With Jimmy Fallon to Good Morning America to Live With Kelly and Ryan to an iHeart Album Release Party and more, the Backstreet Boys made their way through NYC and all of their televised appearances are being uploaded to one convenient spot here. This video album will only be available to the public for a few weeks to give everyone a sneak peek into what is and will be available exclusively to fanclub members this year and beyond! Fanclub Members:Check out this photo album full of exclusive photos from the Boys’ NYC trip. If you were there, you might even see yourself! Also, be sure to visit the FC and blog about your favorite DNA track - we want to hear what you think. Last but not least, don’t forget to redeem your codes for a free album if you’ve purchased DNA tour tickets and spread the BSB love with the ones you love most! The Boys head back to Vegas in one week to kick off the final leg of their Vegas residency before heading out on the world tour. Oh, and there’s that Grammy nomination and Doritos Superbowl commercial in between. 2019 is definitely looking up and BSB is, without a doubt, in our DNA.